This Eden point was found many years ago on the Finley site near Eden, Wyoming. 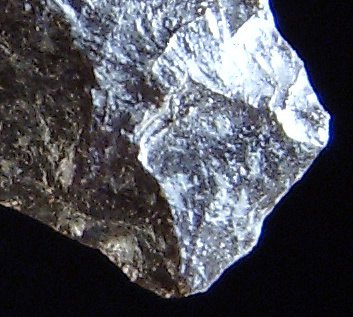 The Finley site is a bison kill site and some evidence for this can be seen on the tip of this point in the form of an impact fracture. This small Eden point may have been resharpened one or more times. It measures 1 9 /16 inches (4 cm) long. Picture shows impact fracture on the tip of this Finley site Eden point.